One of the few hardships about living in Provence is the lack of ‘foreign’ wines available to taste. And I’m not talking Italian, Spanish, or Australian. The Provencal famously think of a ‘foreigner’ as somebody from the neighbouring village. Thankfully in wine terms the definition of ‘foreign’ is a little more elastic with any bottle north of Gigondas being eyed with suspicion. 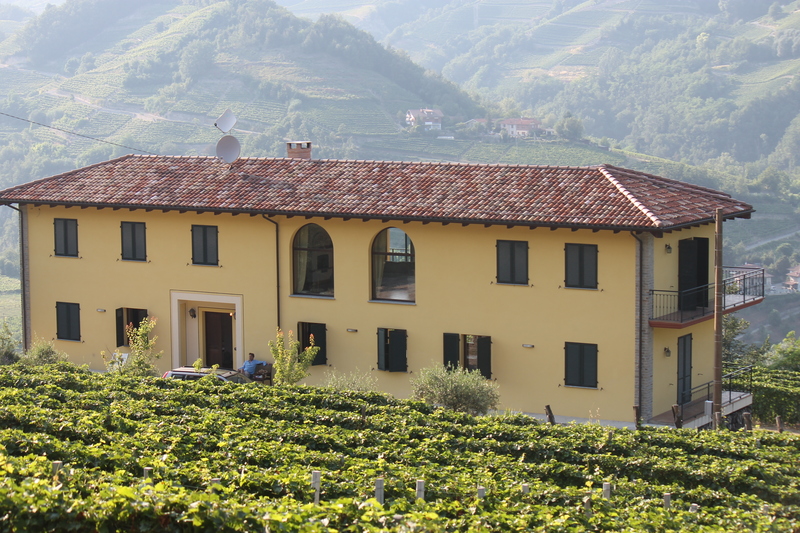 adventure took us to Piedmont one of the major Italian growing regions and home to the world famous appellation of Barolo. 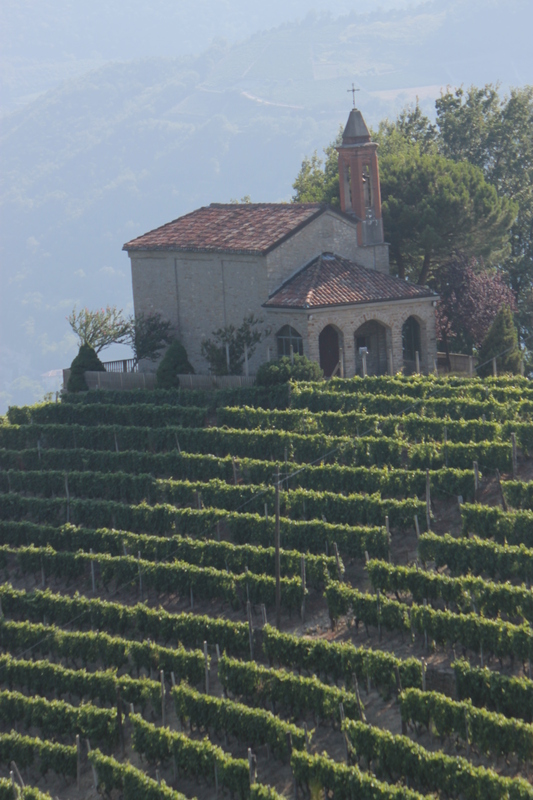 We stayed in the Belbo valley between the two villages of Saint Stephano Belbo and Cossano Belbo. The scenery was stunning. Stepped terraces of vines covered hundreds of hillsides. To begin with we ventured no further than the local cave co-operative finding the light white made from the Arneis grape a refreshing change from the fuller Provencal whites we were used to. Midway through the first week I began to realise that the idyllic peace of our valley was frequently shattered by petrol tankers rumbling along the road adjacent to the river. I reasoned that because of the steep sided hills the Belbo valley had to be the major trunk route for fuel getting into remote areas of Piedmont. I couldn’t have been more wrong. We were at an Italian pool party later that week (no swimming, lots of chatting) when one of our hosts explained that the factories at the neck of the valley belonged to Tesco. The tankers as it turned out were shipping wine not fuel. Bottles are weighty and costly to transport therefore UK supermarkets increasingly tend to bottle their own brand wines in the UK. Independent French vignerons had often told me apocryphal stories of the chemicals that needed to be added to mass produced wine to preserve it on the baking motorways. its rear. Within an hour most of the adjacent hillsides had been treated. The vines in front of our house escaped the flight path of the helicopter, but the next morning a local farmer turned up wearing the type of protective suit worn in radioactive zones. He chugged along on his little tractor chucking out a foul smelling pesticide. We later learnt from our Italian host that up until a decade ago protective suits had not been worn and that cancer rates in the local population were among the highest in Italy. Needless to say we drank no more of the local co-operative white preferring instead the wines of excellent Barolo producer Cordero di Montezemolo. In England, later in the summer, I went big on Chilean wines from Majestic. I bought good (or at least what I thought were good wines) priced between £10 and £15 a bottle. Nearly to a bottle the reds had the unpleasant smell of an oil slick. Near the end of our stay we had a dinner party for friends. I’d initially envisaged serving a selection of New World wines, but I couldn’t bring myself to taste any more. Whether it’s because these wines genuinely are inferior in quality or due to the fact that after 6 years in France my taste buds are now unashamedly Gallic, I opted instead for old favourites of a Loire Sauvignon and a spicy Languedoc red. All of which means that while I am not quite as xenophobic as the average Provencaux, I’m getting closer and closer.